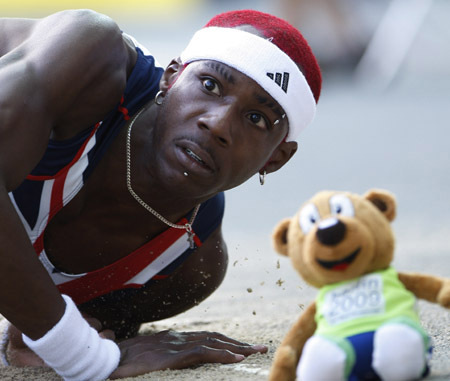 don’t be afraid of it, it’s only a biscuit! Having spent a lovely week in Edinburgh seeing lots of Fringey things, the lady occupying the adjacent seat on my journey home decided to catch up with Celebrity Masterchef. Yep, seen that one – he does something with a crocodile. Oooh, not seen that one – concentrate on your book, Fanny. No spoilers! I managed to reach the comfort of my sofa not knowing the outcome so cracked on with some catching up of my own. 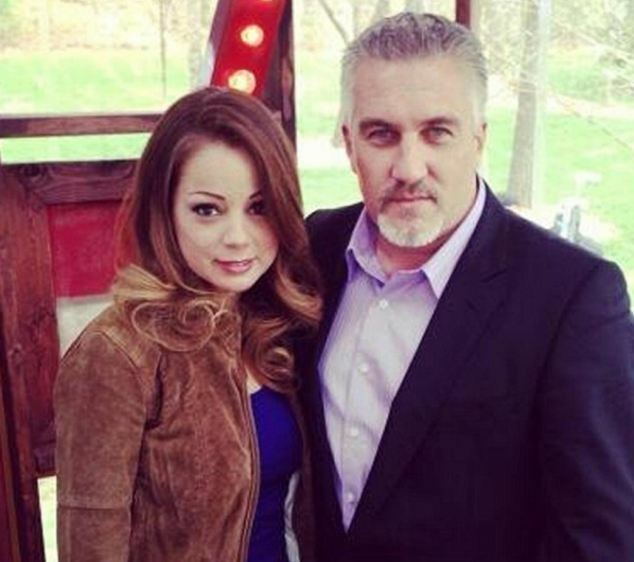 Paul Hollywood, the star of the Great British Bake Off, has spoken about his upset and sadness at the collapse of his marriage, saying he might have been happier if he had not become famous. The baker left Alexandra, 49, his wife of 15 years, amid efforts to launch his career in the US and reports of a relationship with his new co-star Marcela Valladolid, 35. Hollywood, who returns to the small screen with Mary Berry for a fourth series of the hit programme this week, told the Radio Times that he is tempted to “disappear and hide”. The 47-year-old said that he did not have girlfriends until his mid-20s, described himself as an “egomaniac” and “an old man from the rough end of town”. He told the magazine: “I thought I’d spend my life making baguettes, muffins, croissants. I might have been happier if I had. “One day I’ll disappear and hide in a corner of Britain. I’ll own a bakery in a village, live above it, have a big garden because I like mowing. I want to get up when I feel like it, let people queue for my products and when they’re gone, shut the shop and think about tomorrow. Creating magic – that’s my dream. And I’ll do it.” Hollywood called his heartthrob status “a joke”, adding: “I’m an old man from the rough end of town. Wouldn’t you be [flattered]? I lost my youth because I started baking with my dad at 17, and had to get up and go to bed early. There has been speculation that Hollywood’s marriage breakdown could affect Bake Off’s popularity and in May the BBC denied reports that his role on the BBC2 show was under threat. But Hollywood said: “It’s about bakers, not judges. Maybe fame has caused a problem, but it’s not fame as such. To nail it to that would be foolhardy. 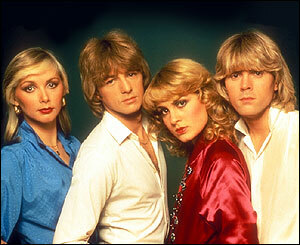 Bucks Fizz once said “if you can’t stand the heat, get out of the kitchen”. I have detested the weather in London this summer but two things have put a smile on my red, sweaty face; return trips to the Olympic stadium for the Anniversary Games (get over it, move on!) 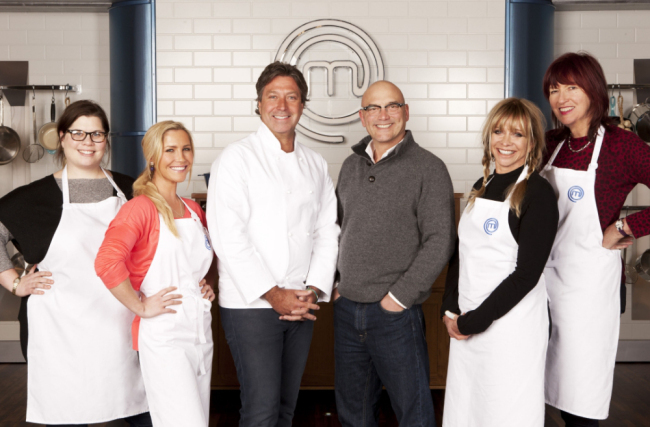 and having Celebrity Masterchef back on my telly – right from the start I could tell we were in for a good ‘un. Excellent. Our first contestants strut towards the camera. Who have we got? Professional grump, Janet Street-Porter. All round sweetheart, Heidi Range. 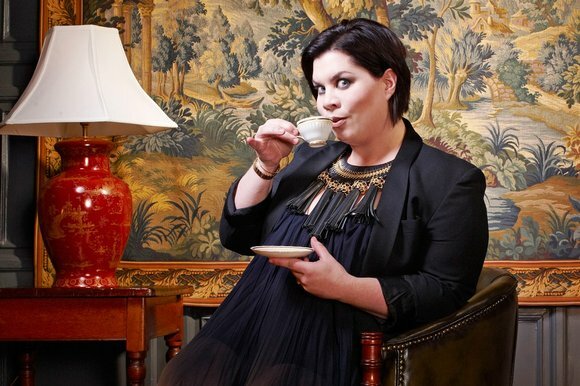 Funny lady and champion Beyonce impersonator, Katy Brand. Business woman and ex-Rolling Stone wife Jo Wood completes the first week’s line-up. The eighth series is under way. Has it really been that many? I’m seeing clips of this year’s cooks and it’s all feeling a bit samey. I’m sure I’ve seen Heidi and Katy wrestle with a mixing bowl before. I know I’ve seen Janet yell at bessie mate Gordon Ramsay and discuss the best way to slaughter animals on Channel 4. Clearly the show and the celebrities are upping their game. It’s gonna be hard to top the last series, but you knew that already. This year’s first week favourite is Katy. She seems quite awesome and likes to fly by the seat of her cheffy pants. Ravioli AND puff pastry? Yep. She pulls it off too, pretty much. Heidi is lovely and smiley and her hands shake when holding a knife. Jo ‘on tour’ Wood tells us how she learned how to cook while travelling the globe with a bunch of old fogies. Jo could be classed as the ‘experimental’ one. Crisps with prawn curry, sweet potato in the shepherd’s pie and coconut oil on something or other. Janet is, well, Janet. I’m struggling to work out Ms Street-Porter. Yes, she has a shtick and she does it perfectly but would she continue to yell at those in authority when in a professional kitchen? Apparently so. John and Gregg may well giggle as they are told to ‘do one’ or ‘get stuffed’ by the former Independent on Sunday editor but huffing and tutting at a head chef in his own restaurant? I would have loved to see Marcus Wareing deal with her. Tales are told of service station pasties, eating at top restaurants and adapting a flight case into a camping stove. Yes, Jo spent 30 years feeding her family on tour. Did she mention that? So, what about the cooking? Largely it was impressive albeit with the obligatory ‘is it duck or pork?’ moment and the ‘are they really putting alcohol in the pudding when they’re about to fly on a trapeze?’ incident. There was also a lot of non-cooking. Possibly more salads in week one than I’ve seen in an entire previous series. “This is Masterchef, not Master Salad Maker!” Quite.